I started writing this post a couple of weeks ago about my plans for training for the Athleta Iron Girl Duathlon in September. To be perfectly honest, I was hesitant to agree to do this event from the get go. My body has been in such limbo land for so long and I had heard straight from the Naturopath’s (ND) mouth, “you need to chill out on the intensity of your workouts.” And she wasn’t joking. This was what she told me immediately after I had just told her about the Insanity Program. She told me my body is working so hard to heal, and that I am taking the energy away from healing the disrupted and imbalanced areas in my body by making it heal the muscles and tissues that need repair from the intense workouts. After the Insanity workouts, my body was completely out of whack. Almost every part of my body was out of balanced and stressed. I had agreed to slow it down with the intensity of my workouts. I asked her about running and she said walking and light jogging would be okay, but nothing more than a mile or two (and she didn’t agree to this right away, it took some persuading from me), and leisure bike rides were okay. But mostly, she recommended I stick to walking and yoga for now. I hadn’t signed up for the duathlon at this point. I was completely psyched about the opportunity to take part in the duathlon. I began training and was taking a very casual approach to training; biking when I could with longer bike rides on the weekends, and was debating on how I would be incorporating some light running into the mix. The debate was coming from my head telling me I shouldn’t be running at this moment in my life, and my heart telling me I can and that I would be surrounded by thousands of inspiring women including some of my wonderful readers! The debacle continued and I still hadn’t started running when I went in for my next ND visit last week. In the last month I have made some major changes to my health: I completed the Clean Program and followed the elimination diet for about a month, I switched from Insanity workouts and running, to walking, light biking, and yoga. I continue to eat sugar-free, dairy-free, gluten-free, soy-free, alcohol-free, and caffeine-free (for the most part) for now until I can be more than 100% sure I am back to health. Besides that I was taking all of my supplements and medications just as I should. My ND also had me on detoxifying drops that are meant to balance out imbalances in the body. For one person, that’s a lot of changes in one month’s time. When I went back this time around, my body was nearly superb. Compared to my whole body being out of balance last time I went in, nearly my whole body was balanced except for a couple of areas. She was blown away at my progress. She told me that everything I was doing was working, and to keep doing exactly what I had been doing. Knowing that this isn’t a forever diet I will need to be following, I knew I could continue to do it. It’s actually not that difficult if you plan ahead. I had a brain and heart battle throughout the appointment regarding whether or not I should tell my ND about the duathlon. I have established a trusting relationship with her and felt that she needed to know. So, near the end of the appointment I told her that I was registered for a duathlon in September. I told her about my casual approach to training and how really my goal is only to finish, I wasn’t concerned about my time (except for I knew there was a 2.5 hour time limit on the bike ride, but this didn’t concern me). She was very glad I told her and just as I suspected, she highly recommended that I shouldn’t participate in the duathlon at this time. She said right now, my #1 priority is getting well and completely healing the body. I am so close to being there and she is afraid that any type of overexertion could set me back again. I really don’t want to be set back again. This has been way too long of a journey already. Basically how she explained it was, even if you are mentally going into it thinking that you will just be taking a casual and fun approach to the whole event, your body doesn’t always take it that way. When it is a timed race event, the body does crazy things. Endorphins run, adrenaline runs, digestive processes increase, and the body gets excited. The body can take it as a fight or flight situation like it is fighting for its life and can become very stressed. For someone who has struggled so long to find wellness, putting my body into any state of stress might be enough to tip me off again. So, collaboratively, we came to the decision that I will not be participating in this years Athleta Iron Girl Duathlon. The hardest part about telling you I am dropping out from the race is knowing that I have talked some of you into doing it with me, and now here I am telling you I can’t do it anymore. My health is my #1 priority. I want to be well. I hope to have a family some day. I know that deciding not to take part in this event is absolutely the right choice for me at this point in my life. I am hoping to be able to be a part of this event in the future. Not only that, I hope to run another half-marathon. It will all come in due time. Just not now. I want this to be a reminder to all of you reading this. If you are sick or if your body is in healing mode, it is okay to take a rest from strenuous workouts. When we workout hard, the body works hard to repair our muscles, meaning it is taking away energy from healing other areas of your body that may need it more (for me, its my GI system and Endocrine system). Even if you physically know you can accomplish something, take a step back and evaluate if your state of wellness can truly handle it. Our poor bodies try hard to send us messages all of the time, and sometimes it takes an outsider telling you to “slow down” for us to actually listen to what are bodies are really telling us. This isn’t meant to discourage athletes from performing at their best, or marathoners to stop training, because more than likely, these athletes are in a better state of health than I am, I am just saying that it is OKAY to “chill out” sometimes if that is what your body needs. Sometimes it’s what our bodies do need and I know mine is thanking me. With all of that being said, since I did start to write a Casual Duathlon Training Plan post, I thought I would still share with you what all what I had written so far. As many of you know, I have registered to take part in the Athleta Iron Girl Duathlon in September. Ladies who are local, it’s not too late to register! Check out this post on how to register. I even included a coupon code so that you can get a discount! As another reminder, I am supposed to be staying cool and calm with my physical activity level. Given that tidbit of info, I have really need to take a step back and think about my approach towards training for this event. I want to train enough so that my body feels comfortable covering the appropriate distances, but not train so hard as to put any extra strain on my body or to stress me out. I have come up with my super casual Duathlon Training Plan. There are no calendars to print off telling you which day to train and at what distance, this is all about listening to my body, getting the training in when I can, and staying relaxed. My goal for this duathlon is simply to finish. The time cap for the 22 mile bike ride portion is 2.5 hours which if I calculated correctly (or if google calculated correctly I should say), would be about a 8.8 mph bike ride. As long as I can maintain a 8.8 mph speed throughout the ride, I can finish in 2.5 hours. My average speed is usually in the 12-15 mph range so I should be just fine. Over the last couple of weeks I have gotten out during the week for a couple of shorter rides, 6 miles or so, and then on the weekend am slowly beginning to cover longer rides. This past weekend was 10 miles over in St. Paul where the route was fairly level. When I go for rides in my neighborhood, I am always subjected to extreme hills which is good training, but on longer rides, I need to take it slow and gradually work up to longer hilly rides. My plan is to increase my mileage each week until I feel comfortable with about 20 miles. I’m still working on my plan for the running training. In my head I keep hearing my ND say “cool it” especially on the running and Insanity program! I feel that if I can comfortably run two miles, that I should be just fine running in the event since the two 2-mile runs are split up by the bike ride in the middle. I will begin casually walking/jogging until I cover 2 miles at a reasonable pace that I feel comfortable with, and will probably leave the running train at that. That is as far as I got on my Casual Training Plan. Again, I hope you all understand why I am doing this. I appreciate all of your ongoing support! I promise I AM doing very well! I am healing! I am coming off of what was one epic weekend. It was an absolute blast having my brother and Ana around all weekend. Our family was able to spend a lot of time together this weekend which of course I just love. Since it’s Monday and since a good majority of us including myself may be a little tired today, I’m going to keep the rest of this post real simple. Here are some weekend snapshots! Thursday night we hosted a small BBQ for our special Colombian guests. Friday I grabbed lunch with the lovely Katie and Becky at Crave at Mall of America. Love love these girls. I ordered the salmon salad which came with mixed greens, salmon, mandarin oranges, goat cheese and pistachios (I think). Honestly it wasn’t anything to write home about but it tasted good still. I think I was so absorbed in conversation that I hardly remember eating it. Yikes! Friday afternoon Dana and I enjoyed a short and hilly bike ride through the neighborhood. I am hoping to do a post this week about my casual approach to training for the duathlon. 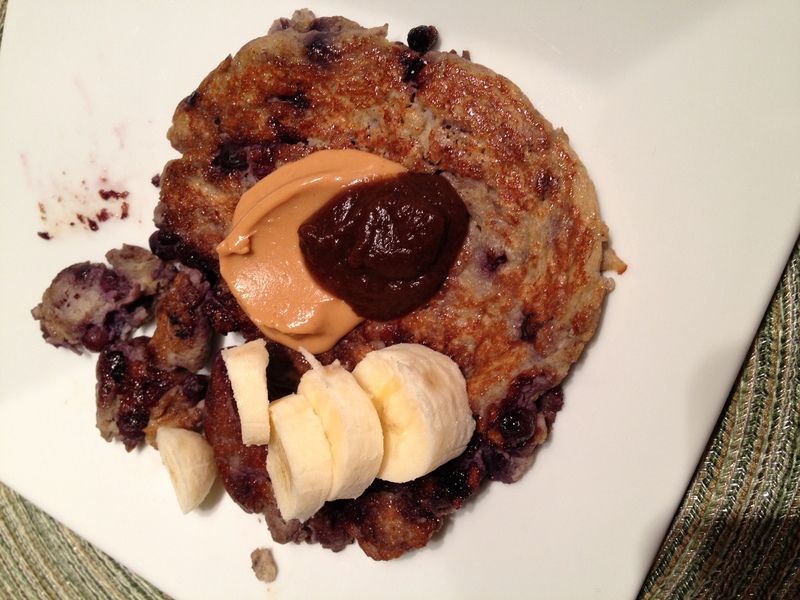 Saturday morning started off with banana with almond butter and no-sugar added dried cranberries. Then we ran a bunch of errands including a trip to the local farmers market where I picked up these beauts for my mom and dad. And later in the evening we had a Mexican fiesta with the family. On Sunday Dana and I took our bikes to St. Paul and biked 10 miles bike along the Mississippi. I LOVE this area. It is beautiful. I finished the weekend off with a homemade Mediterranean dinner complete with kabobs, grilled chicken, mixed green salad, and yellow quinoa (recipe to come for the yellow quinoa). It was an absolute incredible weekend. I hope yours was too! Happppppppy Saturday! I don’t have a ton of fun photos for you today, but I do have a couple of food photos to share from yesterday. 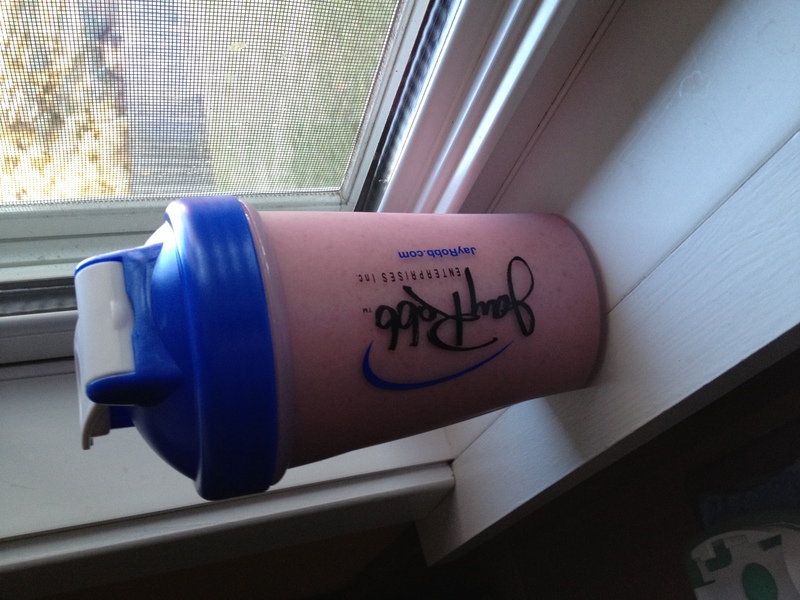 Once again, I used the NutriBullet to whip up a smoothie. I’ve made this one before. In the mix was: banana, kale, almond milk, chocolate egg white protein powder, peanut butter, and aloe vera juice. Lunch: Quinoa, cheese, and peas. This was actually really good despite it being so simple. Sometimes simple is best. It was cooked quinoa, salt, pepper, shredded cheddar cheese, and peas. I keep forgetting to mention that Dana and I have registered for a 10K race coming up at the end of April! My runs have become few and far between, and I’m going to blame that mostly on the weather. I know, lame excuse. Every time I am out for a run I feel fantastic, and every time I am done I always say I have GOT to do this more often. I wish I could bottle up these good endorphins and release them under my nose when I’m not feeling up to a run. Now that I have a race to look forward to, I will be hitting the pavement more often again and am really looking forward to it. Furthermore, the weather is really turning around here which makes it that much more enticing to run outside. Yesterday it was in the 50’s and today it is in the 40’s. The snow is melting super fast and I am loving it. Spring is officially here. Can you spot the cardinal?! Dana, Moose, and I headed out for a rainy run this morning. We tried a new loop in our neighborhood and covered 4.7 miles. Despite it being wet, rainy, and a little chilly, it was still a GREAT run! My endurance and stamina felt wonderful and I am confident I will be just fine for the 10K in April. Moose hung on through the whole run but he isn’t quite used to runs longer than 3 miles after the winter months. His back paws got a little scraped up and he was bleeding at the end of the run. It’s time to build up those paws again! We covered his wounds with socks and he is now fast asleep on the carpet. Poor guy! Since it is rainy, we have decided that today is SPRING CLEANING DAY! I am off to dust, windex, vacuum, and mop! Fun, fun, fun. Kidding, but it will feel really good to do a deep clean on the house. Happy New Year’s Eve! Did everyone have a good weekend?! Mine ended with a Vikings’ football win. As much as I’ve neglected to watch them all season, I really get into the games especially at the end and if they’re doing well. Yes, I’m a fair weather fan. I’ll admit. I guess I can rewind backwards from Sunday to Saturday since I started with Sunday night football. Sunday was pretty quiet. We ran our errands and seriously hit up the Target after Christmas clearance aisles. Dana’s already talking about putting the Christmas lights back up next year. 10 1/2 months to go! We cleaned the house just to tidy it up again and then I headed over to mom and dad’s to watch the game and hang out. I stayed until the 3rd quarter or so then finished the game at my house with Dana and his dad. It was a nail-biter! We were feeling ambitious on Saturday. We started off by suitin’ up for a 3 mile outdoor run. This time the thermometer read 13 but said it felt like 3°F. My legs really don’t react well to this cold weather and I’d be lying if I said I wasn’t the tiniest bit nervous about it, but like I said, I need to remind myself…. It doesn’t matter how fast I go, just go. Just finish. After our run we start tackling our winter project list which included repainting our living room and creating another accent wall with some leftover paint we had from this wall. Over the past two years it got really nicked up from Moose’s toys and bags rubbing against it, etc., and needed a refresher. At Roasted Pear. We had bought a Living Social deal for $20 to get $40 worth of food or drink and decided it was the perfect night to use it. My dinner order was very non-Melanie-like. I ordered the petite filet with french fries. The chance of me ordering a steak is like 1 in 100 coupled with the choice of french fries over a healthier option….very rare. They both sounded good to me though, and I though what the heck?! And I didn’t regret my decision. It was very good! We finished off our night out with a shared hot fudge sundae with a cherry on top. And then went home to our pooch who was waiting to dance with his mama. 😉 Not really, but he was a good sport! So maybe I didn’t learn all of these things this past year, but I was definitely reminded of the importance of each and every one of those statements. I am so looking forward to a very happy, healthy and “lucky” 2013. I will be kicking my 2013 off with a 10K run; what better way to start it off! Happy New Year my beautiful friends! I love you all and cannot thank you enough for supporting me and accepting me for who I am. Question of the day: What is something you learned in 2012? Hola mis Amores! How is everyone doing? I am great. I just finished off a 3 mile run outside with Dana and Moose. It was basically brutal again because of the extremely cold temperatures, but we still finished nonetheless. The plan for the 10K on January 1st is not to worry about time and instead just remember to try to have fun. The goal will be to simply finish. Now I am sitting on the couch in warm sweatpants, drinking a cup of coffee to warm up and we are going to er-er-er rrreewinnndd to yesterday. Mark this on your calendar…I went to the gym yesterday! I eased my way back into the gym routine by cardio’ing 20 minutes on the elliptical, 10 minutes on the stair-stepper, and 5 minutes on the row machine. I then finished with some core work with the Bosu ball. I MUST get back into strength training again because I know how fabulous it makes me feel when I actually do it. I am getting back on the healthy eating train for sure. Lunch was a pretty typical Melanie salad full of dark greens, olives, peas, sunflower seeds, asparagus and Newman’s Own Lite Honey Mustard dressing. My fav. There is definitely something about olives, peas, and sunflower seeds on salads that I enjoy very much. After lunch I dove into one of the most un-fun tasks of all time….sorting through the sock drawer. It had turned into one giant heap of socks and drove me crazy every time I had to go find a matching pair, so I made yesterday a mission organization sock drawer. I did make it more fun by blaring the tunes and dancing around like a little girl. I cracked open one of my new cans of Perrier sparkling water. I went with the grapefruit flavor and I truly enjoyed this drink. It was so refreshing, with a perfectly subtle grapefruit flavor, and the can was just my size. This definitely gets a thumb’s up. For dinner I cooked up a batch of brown lentils: combine 1 cup of lentils and 4 cups of low-sodium chicken broth (you can use water instead if you would like) in a medium pan on the stove. Bring it to a boil, cover and reduce heat to low, and simmer for about 20-25 minutes. Then drain the extra liquid off and set the lentils aside. In the same pan I sautéed a half of a large onion and a half of a green bell pepper. I added in some homemade low-sodium fajita seasoning. Once the veggies were sautéed, I added in the lentils, added more seasoning, and let it all warm through. In the meantime I prepared some quick guacamole: one avocado, one Roma tomato, cilantro, and pepper. I plated up two heaping mounds of dark green lettuce, followed by the warm fajita lentil mix, then some grated cheese, guacamole, and lastly I dressed the whole salad with Parkers Farm Mild Salsa. Ya mix it all together and what do you get? After dinner Dana and I grabbed a cozy blanket, turned on the Christmas tree lights, planted ourselves on the couch, and watched the movie, “Eat, Pray, Love.” I read this book a couple of years ago and have been wanting to see the movie since it came out. Lo and behold Target had it on sale for $4.50 and I just so happened to walk by the rack and snag it. When they make movies from books, 9 times out of 10 I prefer the book (I prefer my own imagination apparently :wink:), but this time I would say I enjoyed both the book and the movie equally. They did a really great job with portraying the characters in the book on film. Dana and I split a super juicy amazing pear that was the size of a softball. It was the perfect and healthy way to end the day. Question of the day: What’s your favorite evening snack? Mine is usually a few dates dipped in peanut butter or a small handful of almonds. Merry Christmas Eve Eve! How is everyone’s weekend shaping up? So, yesterday morning Dana and I geared up for our 6.5 mile run as part of our 10K training plan. Let’s just say my body didn’t quite understand what it was supposed to do with the 9°F weather. Clothing-wise I felt I dressed perfectly, but my muscles and actual body functions weren’t quite up to speed. My running strides had to be so concise and almost “tight” because of the ice and snow on the sidewalks, and my legs literally felt like bricks moving up the hills. My lungs felt like they had never run before either. It was not the prettiest or most comfortable run for me at all, BUT we did finish and it was great prep for our actual 10K on January 1st. In the evening we met up with our dear friends Kate and Luke for a Hibachi dinner at Mount Fuji. They are home from Atlanta for the holidays and I was SO excited to see them! Dinner was very tasty and we were thoroughly entertained! I LOOOOVEEE this picture below! After dinner we met up with some friends and my brother Jeff (!) and had relaxing and festive evening with them. Now I am off to cut coupons, go grocery shopping (it’s going to be madness at the store), and get ready for a family Christmas party! I hope you all are having a wonderful day! Catch up with you later gators! Happy Saturday! I’ve fallen a little behind so the plan is to quickly catch you up to speed annnnnnnddd here we go! After work I suited up and hit the road for a quick two-mile run outside before the sun went down. The temperature was in the 40’s so the weather was decent, but the run didn’t feel good to me at all. I really don’t appreciate afternoon runs and neither does my digestive system. I am definitely more of a morning runner person. For dinner I whipped up a quick banana and egg pancake. Then Dana and I headed out for the night to do some volunteering for the Salvation Army. By the way, I am really feeling the holiday spirit lately. I LOVE Christmas! Breakfast was a chocolate covered strawberry smoothie. I asked for more Jay Robb egg white chocolate protein powder for Christmas. I really really like it. Earlier this week I made another peanut butter chocolate smoothie for breakfast but added kale into the mix and I swear it tasted even better. Thanks again Shannon for the suggestion. NUM. Fast forward to the evening…there were some major comforts happening around this house. 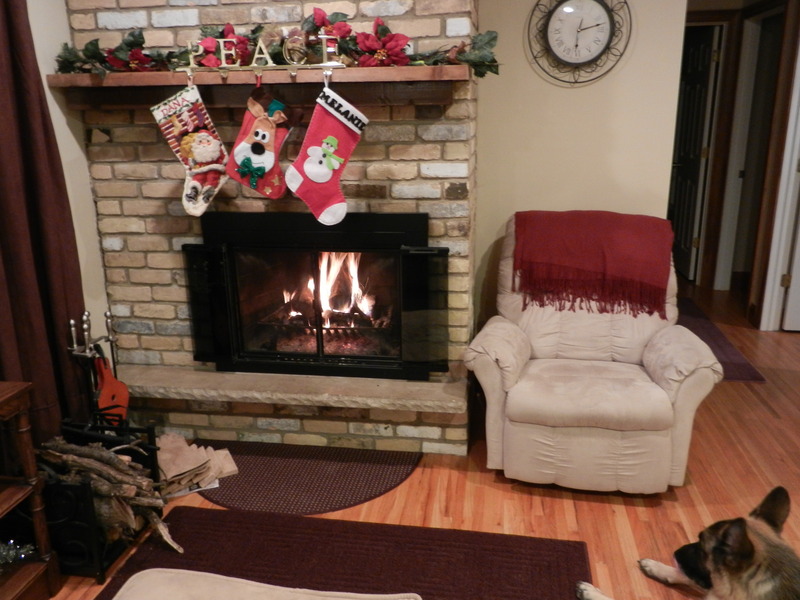 Fire in the fireplace, sweatpants, puppy, hubby, Christmas decorations…. 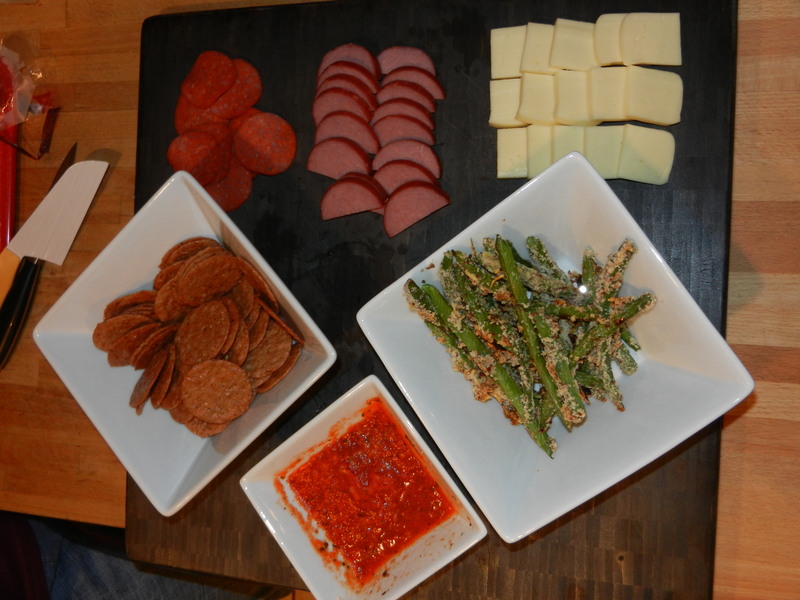 And a meat and cheese platter for dinner which included Nut Thins Pecan crackers (love), amazing havarti cheese which I do believe is my favorite cheese, turkey sausage, and crispy green beans with marinara dipping sauce. For the beans: I dipped the beans into egg whites, then rolled in almond flour, parmesan cheese, salt and pepper. I placed them onto a lightly sprayed pan, sprayed the tops with olive oil, and broiled on low for about 7 minutes until the beans were golden on top. I really enjoyed them! I had to sneak some veggies in somehow so it was the perfect little side. The rest of the evening was spent addressing holiday cards and watching Glee from last week. It feels so good to get the holiday cards all done and ready to mail. The way we had our assembly line set up reminded me a lot of writing out thank you cards after the wedding. This went a whole lot faster though! Now here we are on Saturday. This morning I woke up at my leisure, ate my usual pre-run breakfast, banana and peanut butter, and layered up for our Saturday run. This Saturday was our 4.5 mile run. We are still sticking to our 10K training plan! The verdict: I was actually too warm. I ended up running without gloves for the last third or so of the run. I would much rather be too warm than cold though so I was okay with it. Each run has been a trial in trying to figure out the best apparel and layers to wear for the given temperatures and the way my body reacts. I haven’t quite figured it out yet, but I hope to before January 1st! 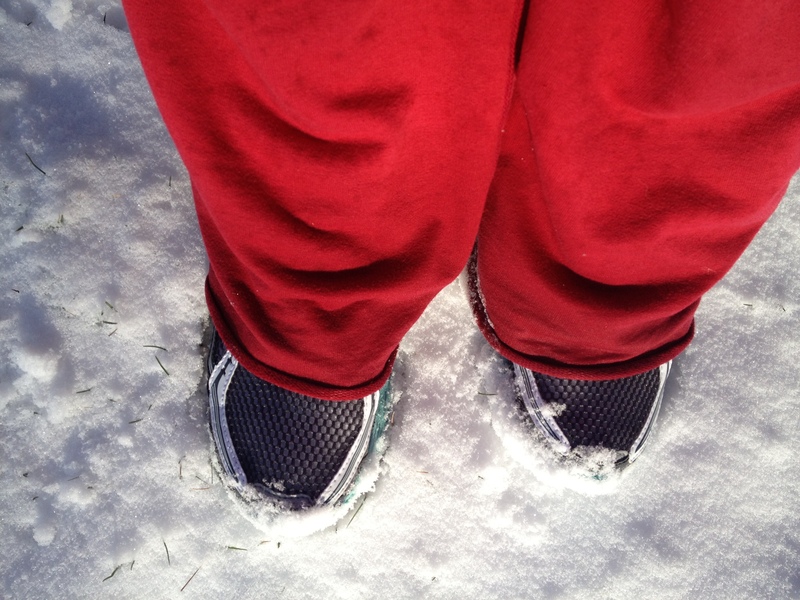 My feet and bottom of my pants were soaked at the end of the run, but that’s to be expected after running in the snow. 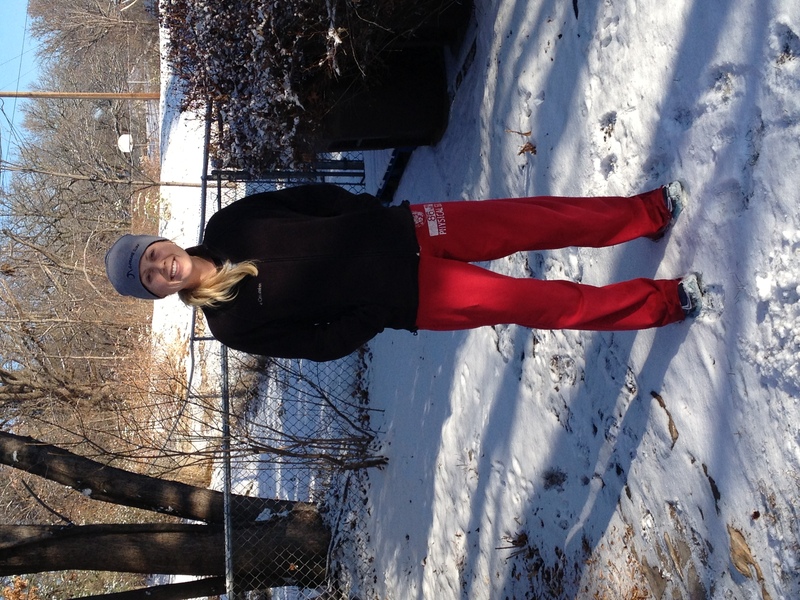 Overall, it was a good snowy run. That was the furthest I have ever run in the snow before. It was like running on wet sand and was definitely more challenging than running on pavement. Question of the day: Is there any must-have winter running gear that you’ve found to be helpful?